This pack of 10 Q-Connect Box Files provides a simple way to store your documents and loose papers neatly and securely. 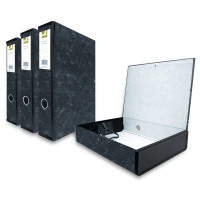 Featuring solid softwood construction in an attractive cloud design, these files are ideal for storing loose papers and documents on shelves and in archive boxes. With a sturdy internal spring clip to hold sheets in place and a label on the spine so you can remind yourself of the contents, this box file is a great aid for sorting and archiving.